This great photo from Bob Oker's son Bill shows Oker Sr. in Aston Martin DB3S factory racer #8 at Santa Barbara. "I was just checking out your new stuff on your website and saw the photos of the DB3S chassis number 115. As you may know, my Dad, Bob Oker, drove a DB3S many times for Joe back in the 1957 time frame. The car he drove looked somewhat different than this one. I suppose Joe may have had more than one of these cars...?? The car Dad drove I believe was chassis number 8. I only have this one shot of this car." 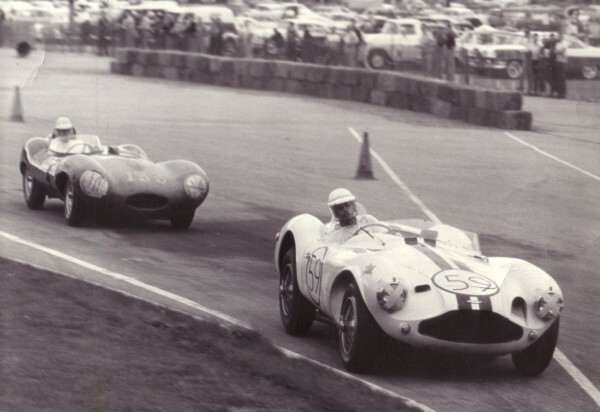 In the photo he's leading Jerry Austin in a D-Type Jaguar.